Discussion in 'Microsoft DOS/V and Windows Games' started by rod_wod, Nov 8, 2017. Klik & Play was made by the same company that made The Games Factory. Purunba includes one 3.5 Floppy Disk. I only just noticed this topic. I always wanted to have Silk Road since Sprite/Chinchilla House's games are pretty good. He re-released this title some time back actually, I bought it on dlsite.com. I think it had several changes to it though, so it will be interesting to compare this release to the newer one. Thanks! I only just noticed this topic. Kitchen panic was also released for psx. 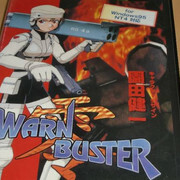 50000¥ for warnbuster zero, yeah...sure Lets_goda2001 dono! rockleevk and bombman like this. EDIT: Has been reuplodaded. Thank you! This is the software behind the making of ReVolte & PureVex also for Windows95 PowerVR. I've been working with TeamEurope over the last month in making sure that all of the game cd's are Dumped & backed up correctly. Check out redump.org for more info. Thanks for 3d Shooting Maker man! Is this for Nec PowerVR only? Nec released a decent amount of pc games inc Bio Hazard that also uses Power VR. I have Last imperial prince, the pc port, by Nec. Here it goes, some TGL stuff... All done with an ad-free link shortener. Will add more info on them later(release date, etc), now off to do some more work, until then, speak later. If you have any troubles just tell me.